COLLEGE STATION, TEXAS—Push-to-talk services over the FirstNet system being built by AT&T already are being leveraged and more use cases are developing as the offering rapidly evolves toward a mission-critical-push-to-talk (MCPTT)-compliant solution during the next few years, according to an AT&T FirstNet official. As an example, Devine noted that LMR systems allow priority to be provided to a particular user and for talk groups to be established, but it is often done on a static basis. With MCPTT, such features can be implemented dynamically and in near real time—for instance, the ability to have a firefighter get floor control in a talk group when his/her blood-pressure or pulse levels meet a certain threshold, he said. “But, with great power comes great responsibility,” Devine said, stressing the importance of management and administration of MCPTT’s future capabilities. AT&T officials have stated that the company hopes to begin offering MCPTT to FirstNet users during the latter half of this year. Devine displayed a roadmap slide indicating that MCPTT network testing is scheduled to begin in the third quarter of this year and that MCPTT with LTE-Broadcast and direct-mode capabilities are slated to be delivered by next March. Under its contract with the FirstNet Authority, AT&T is required to have at least two providers of MCPTT-compliant solutions, Devine said. Last year, AT&T conducted a procurement to select a second MCPTT vendor. Devine said that vendor has been chosen but has not been announced. 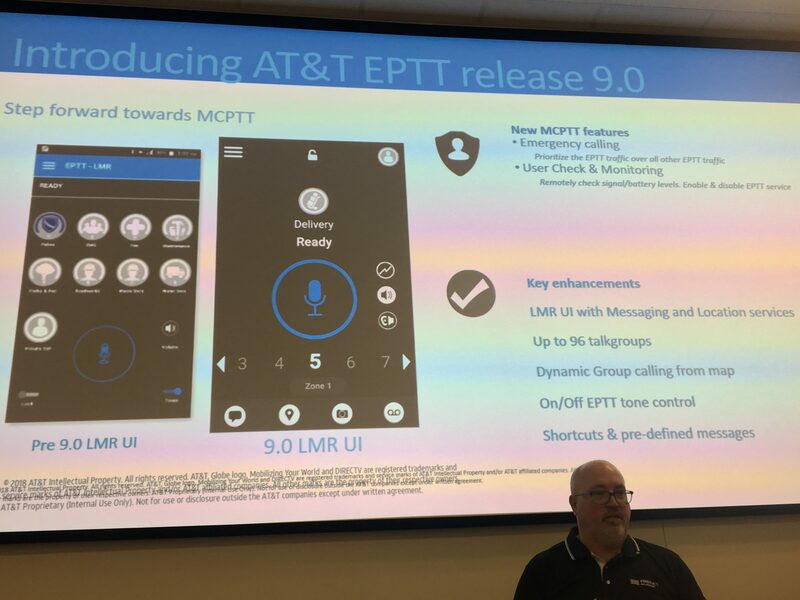 Three MCPTT-standard features—emergency services, user check and user disable/enable—are part of the new EPTT offering, as well as eight other features that are not part of the MCPTT standard approved by the 3GPP standards body that oversees LTE technology, according to Devine. Many in public safety have been wary of vendors providing non-standardized features to otherwise standardized products, because it can create interoperability issues and result in a lack of vendor flexibility. Devine said that AT&T understands the situation and is committed to ensuring that such history is not repeated with MCPTT. “While [these features] may not be in the standard proper, it’s our responsibility to make sure that it is interoperable and compatible across system operators in a manner that would have a degree of compatibility consistent with the standard,” Devine said. “We need to hold the compatibility bar high and make sure that we’re not creating an island here. Some of the most popular use cases for EPTT today is to replace LMR portable devices for employees that can use a non-mission-critical voice solution that can be integrated with the existing LMR system, so existing talk groups are not disturbed, according to Devine. In addition, some mission-critical LMR users are identifying areas where LTE provides better coverage—particularly in many in-building scenarios—and using EPTT as a complementary alternative, he said. “It’s an exciting time—the most exciting time I can remember,” he said. “There’s a lot of work to do, and—to harness some of the potential for first responders that’s inherent in some of these things—it’s going to take some management, some oversight, and it’s going to take being able to identify where this is applicable, where I can use it for push-to-talk today, where I still need to keep my LMR solution, and how I manage those things going forward. And everybody’s scenario will be different. Fidel Liberal, coordinator of the Mission Critical Open Platform (MPOP), echoed this sentiment, noting that many rail and transit agencies in Europe have indicated that plan to replace their LMR systems with MCPTT solutions. Liberal said it is important that providers to follow the 3GPP standards for MCPTT, but he stressed that simply following the standard does not guarantee interoperability. With this in mind, testing actual performance of solutions is critical, he said. Although there are still many challenges that need to be addressed for MCPTT—most notably, in the area of direct-mode communications—Liberal said he is pleased with the progress to date.